When you look at an old saguaro that is maybe 50 feet tall, you can’t help but wonder how the damn thing ever survived so long. It began life as a shiny black seed no bigger than a pinhead and right from the beginning the odds of surviving to adulthood are slim. The best chance for survival comes if a seed gets blown beneath the shade of a nurse tree like a palo verde or mesquite. Saguaro seedlings that grow under these sheltering plants are shaded from the desert’s intense sunlight, blanketed from winter cold, and hidden from rodents, birds, and other animals that eat them. But even if that happens, odds are the cactus won’t make it into its teens. Consider that by the end of its first year a saguaro seedling may measure only 1/4 inch. After 15 years, it’s lucky if it stands a foot tall. By 50 years, a cacti may stand as tall as a man but it’s not until about 75 years that it begins to sprout its first branches, or “arms.” By 100 years the saguaro may have reached 25 feet and those that make it to 150 years can grow as high as 50 feet or more and weigh over 8 tons. Which is why it’s so devastating to see one of these ancient citizens, born perhaps before the Civil War, mutilated from vandals, their stalks riddled with holes from gunshots, their arms hacked at by machetes, their spongy flesh etched with graffiti—someone’s initials or a crude heart with the names of two young lovers inside. It breaks your heart. 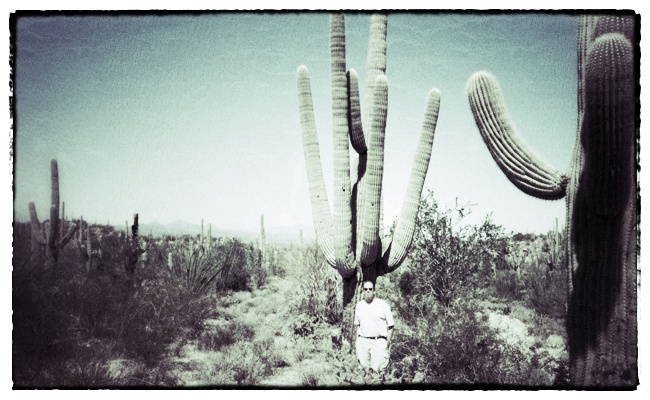 Me and my saguaro brother at Saguaro National Park near Tucson. Photo by David Lansing. Driving west out of Tucson, I stopped at a vista overlook at the top of Gates Pass. From a shady ramada I stared out at a panoramic view that included Kitt Peak some 36 miles southwest and the Santa Rosa Mountains another 20 miles due north. In between were endless miles of the surprisingly lush and diverse Sonoran Desert with over 2,700 known plant species from deep green paloverde trees to bitter buffalo gourds. But the most dominant figure is the magnificent saguaro, looking solemn and serene. Like cacti buddhas. 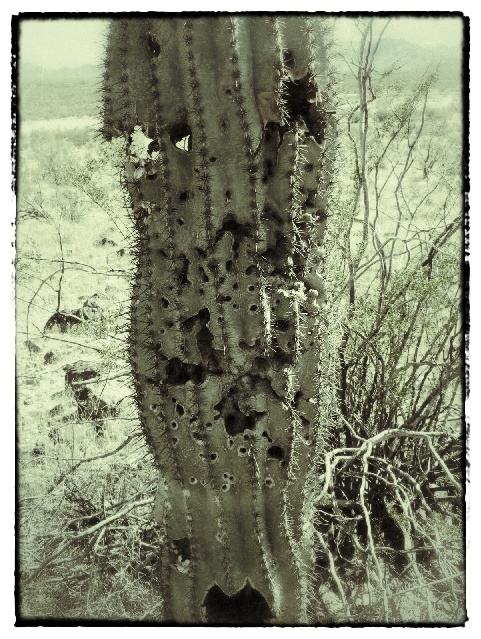 There is something about the saguaro that has always fascinated me. Perhaps it is their too-human shape, their arms upraised as in perpetual if prickly welcome while others bend and twist, giving each cactus a distinct personality. Slowly driving through the mostly dirt road of Saguaro National Park, I couldn’t help but stop—over and over—to get out and admire these most regal of desert plants and, using a self-timer, have my picture taken standing beside them. As if I were at a family reunion and these were my kin; my prickly, ancient relatives. The town of Fort Apache, a place the U.S. Army built when they were trying to capture Geronimo, sits forlorn and mostly abandoned in a valley between two scrub-covered plateaus overlooking the White River. The wind whistles through the canyon, stirring the trees. In the parking lot of the White Mountain Apache Motel, where I am staying, are men with pickups and horse trailers with signs on the side reading “I Buy Antlers.” While I sip my coffee, a muddy Toyota 4WD pickup pulls up. In the back are four children and a load of antlers three feet high. A large man in a 10-gallon hat, like Hoss Cartwright used to wear on Bonanza, weighs the antlers for which he pays $7.50 a pound. I wander over to Hoss and ask him what he does with the antlers and he says he buys them for a guy in Oregon who turns them into furniture and chandeliers. The really beat up ones he grinds up and sends to Korea to be sold as an aphrodisiac. 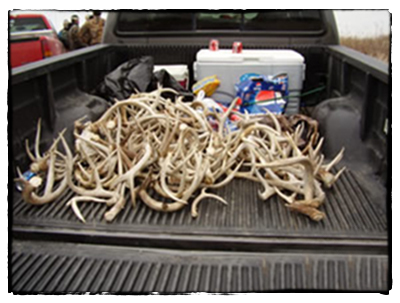 All afternoon pickup trucks pull into the parking lot of the White Mountain Apache Motel loaded with antlers. Late in the afternoon Hoss pulls away from the hotel with his overloaded horse trailer. I sit outside my room, looking out at this land of plateaus and buttes and junipers and scrub oaks, listening to the wind as it blows around the plastic bags and fast food wrappers in the parking lot, until it gets dark and I can no longer see anything. 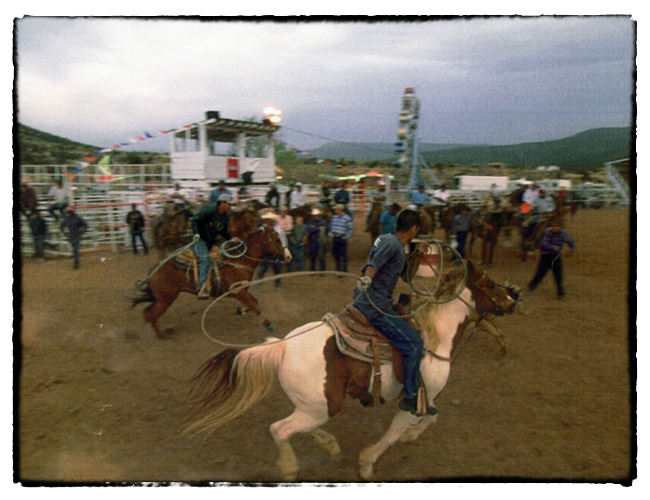 At the White Mountain Apache rodeo, cash bets are taken by a young woman in the cab of an old Ford pickup. Fives and tens and twenties are exchanged and chit notes given. The cowboys line up beside the pickup three and four deep while their wives and girlfriends wait over on the side. Young kids in baggy pants and too-big shirts run around the carnival grounds where bored carnies lean against the stairs to the Tilt-A-Whirl or Sizzler, both of which have no riders. Dogs—blue heelers or Australian herding dogs—yap at the horses and the bulls. One young cowboy, no more than 15 or 16, drives five or six steers out of the gate and into the arena both to make sure the gates are working and to see which way the steers will break when they get inside. For anyone used to the boisterous nature of a Saturday football game, this is a quiet affair. Almost religious. The loudest sound is the flapping of American and Arizona flags above the arena and the nervous, constant whinnying of the horses. Emotions are as flat as the landscape, as brooding as the threatening sky. 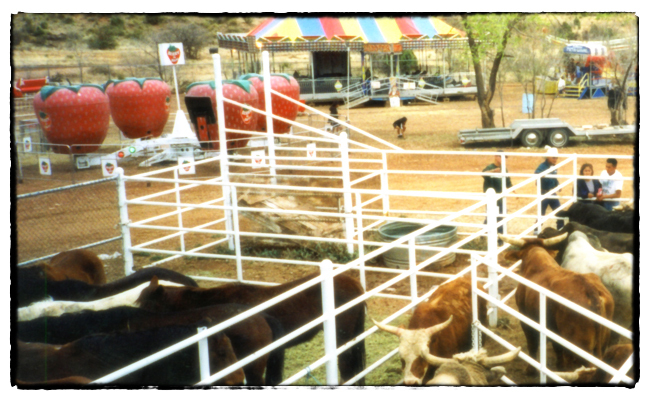 The carnival grounds behind the bull pens at the White Mountain Apache Reservation rodeo in Arizona. The cowboys at the Apache rodeo don’t talk to the women. The women have to go over to the side and huddle amongst themselves but they don’t speak or even look at their husbands or boyfriends while the rodeo is going on. Maybe it’s considered bad luck. At the foodstand, four ancient Apache women ladle big spoonfuls of lard into frying pans over propane burners and cook up Indian fry bread which they then fill with refried beans. It’s like a giant fried bean pizza. Obese kids sit in the dusty stands gobbling down the fry bread and beans or an Indian taco while the rodeo announcer encourages everyone to go on up to the snack bar and fill up. Little kids are going around the stands during the rodeo selling raffle tickets for a fund raiser for the grade school’s 6th grade trip to Phoenix. The grand prize for the raffle is “Beef.” They don’t say how much beef; just Beef. Other prizes include a quilt, case of Coke, and something listed as “Movie Posters.” There’s a sad little carnival going on behind the rodeo and the kids run over there for an hour or so and come back to their parents carrying plastic sandwich bags with goldfish in them and the fish cook in the sun and the hot water in the sandwich bag until they die and the parents make the kids dump the dead fish out on the red dirt. All the kids stand around staring at the dead fish in the dirt and kicking them around with their dusty shoes.